Sleep apnea is a sleep disorder that causes you to stop breathing during sleep, so the brain and the rest of the body doesn’t get sufficient oxygen. There are two types of sleep apnea: obstructive sleep apnea and central sleep apnea. 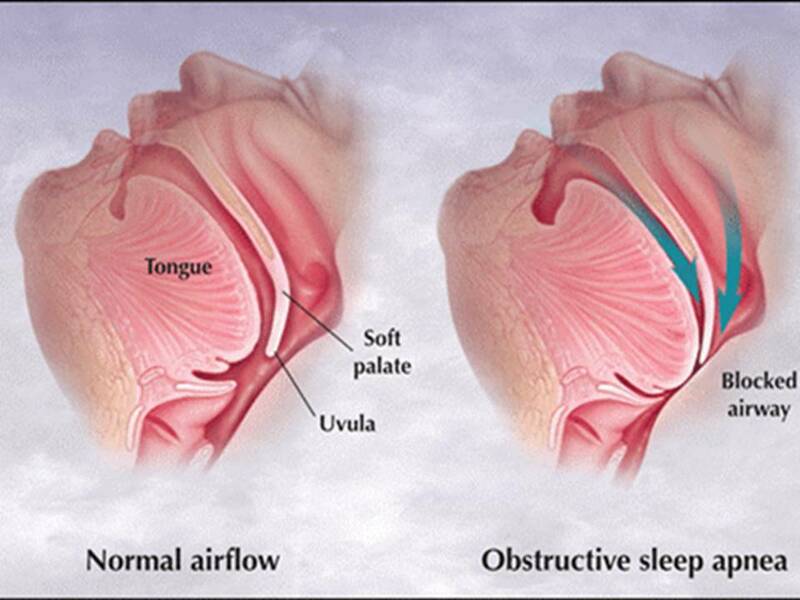 Obstructive sleep apnea is more common and is due to a blockage in your airway, usually collapsed throat tissue. Central sleep apnea on the other hand, happens due to respiratory control instability, which makes it hard for the brain to signal to the muscles to breathe. These sleep problems can affect adults and children regardless of age. Males are more vulnerable though especially if you’re age 40 or above. Studies show those with small jaw bones, large tonsil or tongue are also more susceptible. You’re also at risk if your family has a history of sleep apnea or you have gastroesophageal reflux. This condition also often affects those with sinus problems, allergies or a deviated septum. Sleep apnea symptoms include waking up with a dry throat, loud snores, and sometimes waking up gasping or feeling like you’re choking. During the day you’ll feel sleepy and lethargic, which is dangerous if you’re driving. The longer it goes untreated, the more severe the symptoms get and include morning headaches, mood swings and forgetfulness. The most common treatments are mouthpieces and breathing devices, but they can be uncomfortable and make it harder for you to sleep. There’s also surgery but beside it’s expensive and beyond the reach of most people, it is also very invasive and painful, and many times not solving the problem. A more natural approach, non-invasive and easy to use is Home Salt Therapy by Saltair device. Saltair device uses ultrasonic frequency vibrations to turn saline solution into micro-particles of salt that are dispersed into the indoor air for breathing. This device simulates the salt cave or seashore aerosol, offering great benefits in all respiratory diseases, including snoring and sleep apnea. The salt particles make their way into every tiny airway, into the upper and lower respiratory system, to alveoli in the lungs, promoting better blood oxygenation, reducing inflammation and fluidizing the mucus. The salt particles are anti-bacterial, anti-viral and anti-fungal, fighting respiratory infections and strengthening respiratory immunity. Sleep apnea is a complex disease, that can involve even psychological factors and physical abnormality, and it should be treated accordingly through all existing treatment avenues. Home salt therapy is highly recommended to be added to your sleep apnea treatment or your sleep apnea management plan because of the anti-inflammatory and mucolytic effects of the salt aerosol and promoting better blood oxygenation. With continuous use, you’ll be able to sleep better, get more oxygen into the bloodstream and increase well-being.